Divergent, based on Veronica Roth’s best selling book series and the first surefire blockbuster of the spring, has several interfaith stars in its cast. 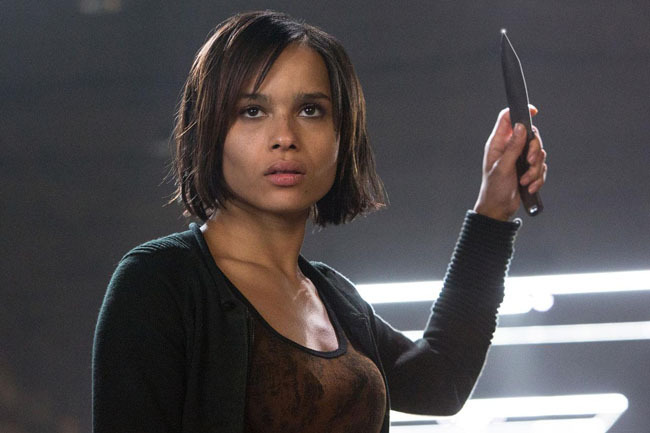 Besides Tony Goldwyn and Miles Teller, who both have paternal Jewish roots and were covered recently in this column, Zoe Kravitz plays the key role of Christina, Tris’ (Shailene Woodley) best friend in the movie, opening March 21. The daughter of musician-actor Lenny Kravitz and actress Lisa Bonet, Zoe has a Jewish paternal grandfather and maternal grandmother, and identifies as Jewish though she’s not religious. While Kravitz is not on the cast list for the Divergent sequels Insurgent and Allegiant (conclude what you will), she’ll be in a high profile project next year: the Mad Max reboot Fury Road, with Tom Hardy and Charlize Theron. 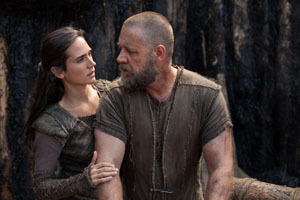 Fittingly for a Biblical story, Noah, opening March 28, has some Jewish roots: Director Darren Aronofsky (Black Swan) and Logan Lerman (the Percy Jackson movies) are both Jewish, and Jennifer Connelly, who plays Noah’s wife opposite Russell Crowe is from an interfaith family. Of Polish-Russian descent, her mother was Yeshiva-educated, and her Roman Catholic father is of Irish and Norwegian heritage. Connelly has been married for 11 years to her Beautiful Mind co-star Paul Bettany, with whom she has three children. Scarlett Johansson. Credit: Warner Bros. The always-busy Scarlett Johansson has two movies opening on April 4. The higher profile of the two is Captain America: the Winter Soldier, the latest installment in the Avengers saga, in which she reprises her role as redheaded Natasha Romanoff, a.k.a. Black Widow. Jewish on her mother’s side, Johansson simultaneously opens in Under the Skin, playing an alien on earth disguised as a human. Equally prolific James Franco can be seen on screen, stage and in the bookstore. His latest film, Maladies, about the struggles of a soap star in the ‘60s, opens in Los Angeles March 21 and is available via iTunes and VOD March 25. He’s also making his Broadway debut in Of Mice and Men. The John Steinbeck play, at the Longacre Theatre, co-stars Chris O’Dowd and Leighton Meester, now in an interfaith marriage: She wed Adam Brody (The O.C. ), who is Jewish, in February. Franco who is Jewish on his mom’s side also just released a book of poetry called Directing Herbert White. Also visible in an uncredited appearance in the Veronica Mars movie, he has a dozen other films in the pipeline for 2014 and 2015. Zoe Lister-Jones, whose face will be familiar to fans of The Good Wife and Whitney, on which she recurred, is in the cast of the new CBS ensemble comedy Friends with Better Lives. She’s playing a single girl from Brooklyn, a role that’s close to home: She was born in the New York borough and was raised in her Canadian-Jewish mother’s faith (her father isn’t Jewish). In the sitcom, Lister-Jones plays one of six pals (including James Van Der Beek, Brooklyn Decker and Kevin Connolly) who is desperate to get married, but can’t get past her über-pickiness when it comes to men. The premiere is March 31. It Felt Like Love, a frankly told story of a teenage girl’s sexual awakening, is notable for strong performances by its newcomer cast, several of whom have an interfaith connection. The indie film, written and directed by Jewish director Eliza Hittman, stars Gina Piersanti in the central role of a virgin who tires of playing third wheel to her best friend and her boyfriends and grows up too quickly for her own good. Jewish on her mother’s side, Piersanti was raised in her mother’s faith and had a bat mitzvah. Her character’s older crush, played by Ronen Rubinstein, is of Russian-Jewish heritage and was born in Israel. The cast also includes Jesse Cordasco, whose mother is Jewish but non-practicing. The film opens March 21 in New York and March 28 in Los Angeles and Chicago, with other cities to follow.